Other Names: Mike Mayo(WWE), Kid Kruel, "The Shooter" Mike Kruel, "Your American Hero", "Modern-Day Warrior"
- CHIKARA The Renassiance Dawns (May 25, '02) = Kid Kruel defeated Zane Madrox. - 3PW 1st Anniversary Show (February 15, '03) = Kid Kruel was beaten by Kid Kash. - CHIKARA Aniversario (May 23, '03) = Mike Kruel and Reckless Youth 'survived' a "Double Jeopardy Battle Royal". Later on, Kruel defeated Reckless Youth. - 3PW A New Era (June 21, '03) = Kid Kruel fell to Josh Daniels. - CHIKARA You Be The Booker! (June 23, '03) = Mike Kruel fought to a Double Disqualification with Reckless Youth. - 3PW That's Incredible! (August 16, '03) = Mike Kruel lost to Joey Matthews. - 3PW Su-Su-Superfly (December 27, '03) = Kruel & Monsta Mack defeated Amish Roadkill & the Blue Meanie. - 3PW 2nd Anniversary Show (February 21, '04) = Kruel was beaten by Slyk Wagner Brown. - ECWA 8th Annual Super Eight Tournament (April 3, '04) = Kruel took down Ricky Reyes, then lost to the eventual winner, Christopher Daniels. Due to Daniels winning, Kruel voluntarily handed over the ECWA Heavyweight Title. - 3PW The Future Is Now (April 17, '04) = Kruel won over Monsta Mack. - 3PW Not Enough Time (May 15, '04) = Kruel lost a "Three Way Dance" to Ruckus. Damian Adams was the other participant. - 3PW Splintered (June 19, '04) = Kruel fell to Damian Adams. - 3PW No Limits (July 17, '04) = The Pitbulls 2000 (Kruel & Gary Wolfe) defeated Amish Roadkill & the Blue Meanie. - 3PW Five-Star Four-Way (August 21, '04) = The Pitbulls 2000 competed in the "3PW Tag-Team Titles Battle Royal", which was won by Slyk Wagner Brown & April Hunter. - 3PW Till We Meet Again (October 16, '04) = The Pitbulls 2000 won the 3PW Tag-Team Titles, beating Slyk Wagner Brown & April Hunter. - 3PW For The Gold (November 20, '04) = The Pitbulls 2000 retained the 3PW Tag-Team Titles, taking down Damian Adams & Monsta Mack. 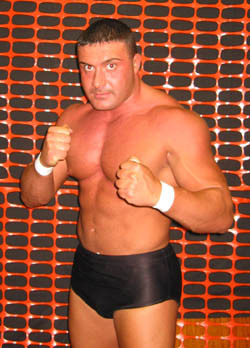 - 3PW 3rd Anniversary Show (February 19, '05) = Kruel defeated Matt Striker. Later on, Kruel & Simon Diamond won the vacated 3PW Tag-Team Titles, winning over Damian Adams & Monsta Mack. - RoH Stalemate (April 16, '05) = Kruel fell to CM Punk. - RoH Escape From New York (July 9, '05) = Kruel was beaten by Matt Striker. - OVW Six Flags Summer Sizzler Series '06 (August 11) = Kruel competed in a Battle Royal, which was won by Jack Bull. - OVW Super Summer Sizzler Series '07 (June 1) = Kruel fell to Chris Benoit. - OVW Summer Sizzler Series '07 (July 6) = Kruel & Vladimir Kozlov lost, via DQ, to Colt Cabana & Idol Stevens. - OVW Summer Sizzler Series '07 (August 3) = Team America (Kruel, the Belgian Brawler, & Los Locos) lost, via DQ, to Team Snow (Al Snow, Colt Cabana, Atlas Da Bone, & Chet the Jett). - OVW Summer Sizzler Series '07 (August 10) = Team America (Kruel, Vladimir Kozlov, the Belgian Brawler, & Los Locos) lost a "Capture The Flag Wargames" Match to Team Snow (Al Snow, Colt Cabana, Atlas Da Bone, Robert Gibson, & Chet the Jett). - OVW Summer Sizzler Series '07 (August 17) = Kruel defeated Eugene. - OVW Summer Sizzler Series '07 (August 24) = Kruel again won over Eugene.